Any full-flavoured cheese like goat's cheese, Stilton or Pecorino is a great match with this warm salad. Pour the olive oil, cider vinegar, honey, salt and pepper into a medium glass jar. Pierce the chilli fi ve times with a sharp knife and quarter the ginger. Add to the jar with the garlic and the thyme on the stems. Put the lid on tightly and give the jar a couple of shakes to emulsify the liquid. Leave in the fridge overnight if possible for the fl avours to infuse. Cook the corn in boiling salted water for 10 minutes, then remove from the pan and allow to cool slightly. Cook the broccoli in boiling salted water for 4 minutes. Cut the corn kernels from the cob and cut the endives into quarters lengthways. 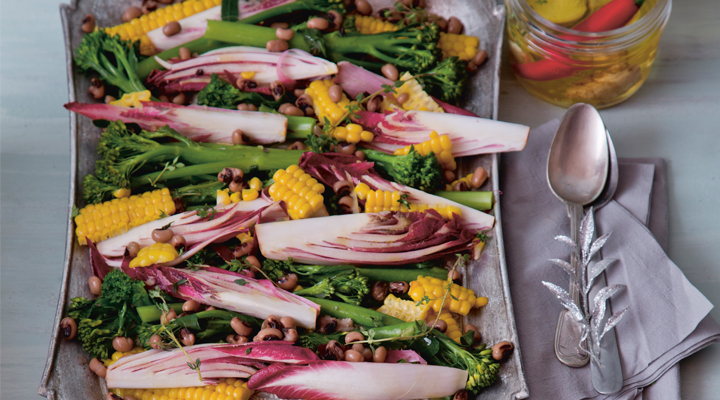 To serve, pile the vegetables onto a serving platter. Remove the garlic, chilli, ginger and thyme from the dressing and drizzle it over, then sprinkle over the drained beans and some fresh thyme leaves.